E-DataAid supports undoing all modifications made during the current E-DataAid session. The most current modification may be undone by using the Undo command in the Edit menu or the Undo tool button on the toolbar. To undo previous modifications, continue to use the Undo command until the desired operation is reversed. 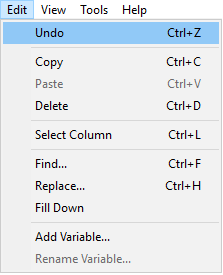 If no modifications have been made to the file (i.e., there is nothing to undo), the Undo button and command are disabled.